We now have answers to these and other questions, but to get to them we need to set aside preconceptions and come to terms with something that isn’t simple. 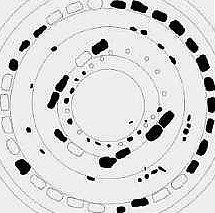 There is a different but relevant greater anomaly than all of Stonehenge’s anomalies put together; and that anomaly has now been resolved. Not surprisingly, many scientists found this hard to believe. They pointed out numerous mistakes by Velikovsky. They considered the notion that Venus had exploded out of Jupiter especially bizarre and contrary to the laws of physics. In turn, this led many to consider Velikovsky a kook and to dismiss his theory out of hand. Once we reinterpret the origin of Venus in this way, then the remarkable astronomical, geological, archaeological, historical, calendric, iconographic, and linguistic evidence that Velikovsky amassed in favor of the Venus theory comes to bear. And now telling new evidence from Greece, the Ancient Near East, China, and Mesoamerica adds to it, as do new interpretations. 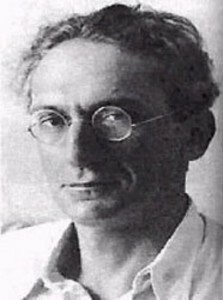 Thus it seems fair to say that Velikovsky’s Venus theory, with one important correction, has triumphed, though some of his claims were clearly ungrounded2 and many peripheral issues remain open to debate. Velikovsky had a second theory as well. Herodotus wrote that Egyptian priests had told him that four times since Egypt became a kingdom “the Sun rose contrary to his wont; twice he rose where he now sets, and twice he set where he now rises.” Velikovsky interpreted this to mean that during four approaches of Venus the interaction had caused Earth to turn over. He adduced some evidence for inversion, and physicist Peter Warlow in his book The Reversing Earth3 supplied a mechanism to explain it. Now we have rough estimated dates for the four inversions: 2200, 1628, 1210, and 820 BC,4 and these dates roughly match Chinese and Egyptian dynastic collapses. We also now know that the slow retrograde rotation of Venus was a consequence of tidal locking as it passed Jupiter. Jupiter’s gravitational pull also stretched the comet-planet almost to separation, leaving it ovoid, as is depicted in ancient iconography. Venus first approached Earth around 2525 BC (Velikovsky thought it was around 1500 BC). In other words, we are in a much better position than Velikovsky was to interpret the Bronze Age catastrophes, though he deserves great credit for his two wonderful theories. What does all this mean for Stonehenge? 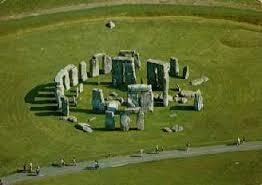 Various pieces of evidence suggest that Stonehenge began its career around 3000 BC as a combined solar and lunar site. (It also came to serve as a place of interment of cremated remains.) The centerline of the northeastern entrance had a declination of +27º, close to that of the major lunar standstill.5 Meanwhile, even though various suggestions for how the ring of 56 Aubrey Holes could have served to predict eclipses have not been widely accepted, the Holes remain very suggestive of some kind of method for predicting eclipses, and thus Stonehenge was presumably both a solar and a lunar site. Keeping a balance between gods seems to have been important to the people who ran Stonehenge, the principle being to avoid neglecting either deity because that could bring trouble. When Comet Venus first approached Earth around 2525 BC, gravitational interaction had dramatic consequences, in all probability including volcanic eruptions that generated atmospheric dust, earthquakes, and floods. The awesome appearance of Comet Venus and the accompanying devastation evidently inspired fear in peoples worldwide. Kings, chieftains, and shamans, whose credibility was at stake, responded by building sites or adapting existing ones to track Venus but also to propitiate the terrifying new god. These sites typically contained a Venus effigy that the comet god could see as he/she passed overhead. Many cultures depicted Venus as a serpent (e.g., Quetzalcoatl, the plumed serpent). Because the planet’s large body blocked solar rays from the central portion of its tail, only the two sides of the tail were lit, as if they were horns, leading Mesopotamians to term Venus the Bull of Heaven, as Velikovsky pointed out. In Greece Venus was named Poseidon, Bos eidon—the Bull of Heaven. Other peoples depicted the body of the planet and the twin tails as a bird, as at Karahunj in Armenia; in China it was called the Vermilion Bird. Still others thought in terms of geometry. If the Sun was a circle and the Moon a crescent, the new comet-planet became an oval. 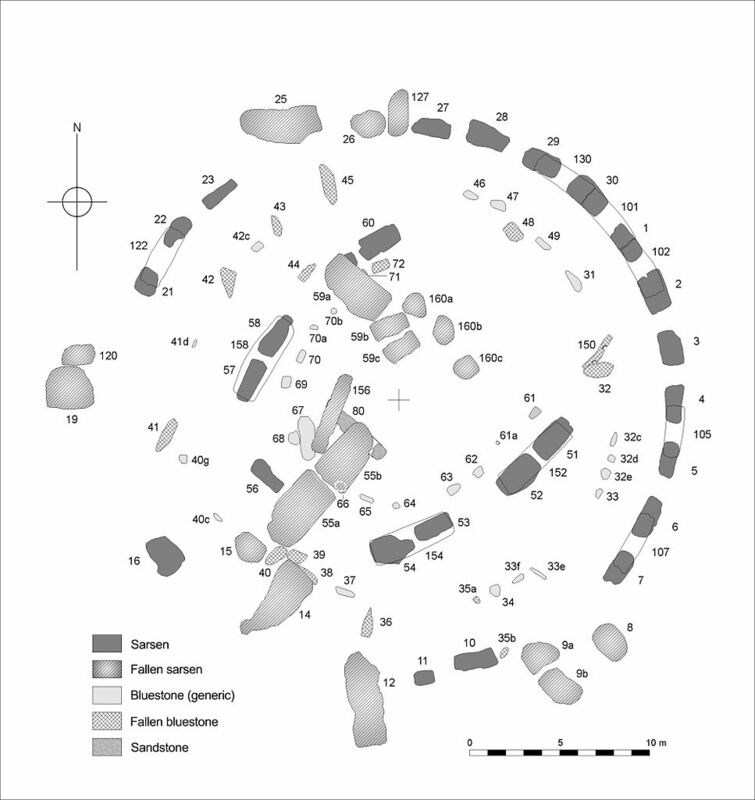 Many sites, especially mounds, appear to have had ovals on top of them where rituals were conducted; over time these ovals often transitioned into circles and rectangles. 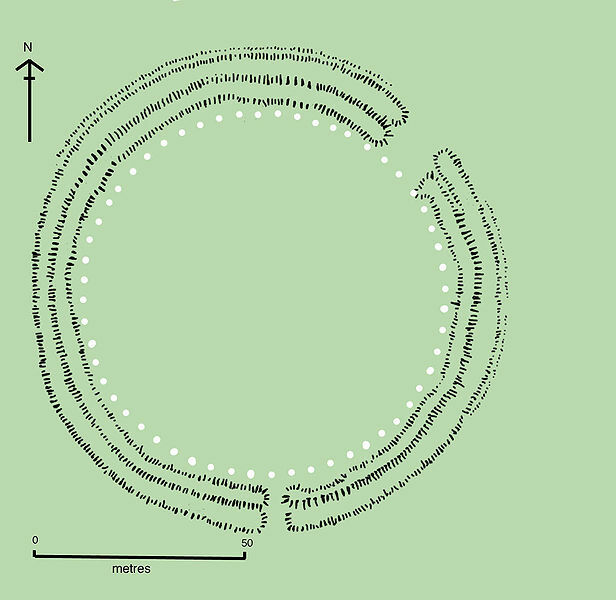 Silbury Hill north of Stonehenge is a circular mound, perhaps with an originally oval top, erected around 2500 BC at enormous effort, most likely for tracking Venus, worshipping it with sacrificial rites, and providing refuge in the event of a megatsunami. In response to Venus’ first approach, the ruler of the Stonehenge region arranged for bluestones to be shipped from Wales (alternatively, collected from nearby glacial erratics), had giant sarsens (sandstones) hauled to the site, and ordered a stone monument constructed to replace the presumably largely or wholly wooden existing one. In keeping with the previous practice of balancing the Sun and Moon, the builders sought to keep a balance between the fearsome new comet god and the mighty traditional ones, though we must suspect that the Moon received a good deal less attention than the Sun. That meant that they expanded the northeastern entrance southward to insure that the Sun’s rays at summer solstice sunrise would penetrate into the center of the site. Using the geometry of a diffraction grating,7 the builders arranged the tall sarsens of the Trilithon Horseshoe symmetrically around the main northeast-southwest axis in an arc representing the arc formed by Comet Venus’ body and twin tails (plan by Anthony Johnson, Wikimedia Commons). A parallel arc concept can be found in the original version of the Chinese myth of Archer Yi and his vermilion bow (Venus appeared red as seen through atmospheric and interplanetary dust) that targeted (shifting with the solar wind) the ten suns that appeared on successive days (as Earth inverted), sparing the tenth one. There are many reasons to think that the site was oriented primarily toward the southwest.8 The flat, smooth side of the Great Trilithon stones, for instance, was turned to face southwest in order to salute the Evening Star, in contrast to the other stones, which faced inward. As had other peoples worldwide, Stonehenge’s builders evidently recognized that the Morning Star posed no threat. It was the Evening Star that could disappear at Inferior Conjunction and approach Earth. Hence the need to monitor the Evening Star meticulously, especially at its greatest elongation, to ensure that it was on track and would not approach Earth. It was also necessary to make sure that the heliacal rising of the Morning Star would occur as expected after eight days of Inferior Conjunction; if it didn’t, that could be a sign that Venus was approaching. How Stonehenge was used to monitor Venus remains a topic for future research and needs to be considered in conjunction with the alignments of other megalithic monuments built in the period after ca 2525 BC.9 The insertion of four Station Stones at Stonehenge may have contributed to such monitoring because they would have assisted in tracking the setting of the Evening Star to the northwest around summer solstice. In spite of the focus on the Evening Star that the size and geometry of the Trilithon Horseshoe indicates, the builders’ apparent concern for balance suggests that the orientation of the Great Trilithon toward the southwest was also intended to honor the setting winter solstice Sun. Thus Stonehenge could serve as a site where processions along the Avenue from the River Avon could approach the site at winter solstice dusk to honor the setting Sun and the Evening Star in the southwest and at summer solstice dawn to honor the Sun and the Morning Star in the northeast. For the sake of comparison, the wooden southern circle at nearby Durrington Walls, thought to be the lodging place of the Stonehenge workers, was entered from an avenue from the river on the southeast and had its main orientation, with a horseshoe array, toward the northwest,10 which would have been useful for tracking the setting Evening Star at its greatest elongation around summer solstice while honoring the setting Sun at summer solstice. 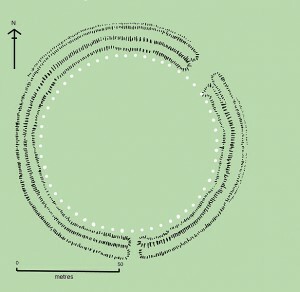 Nearby Woodhenge ring was in the shape of an oval. 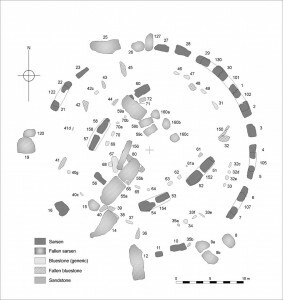 The pristine megalithic configuration of Stonehenge flourished from ca 2525 to ca 2200 BC. But every 52 years Venus approached again, and these approaches caused disruptions, setting off migrations of peoples, including perhaps that of the Beaker Ware people around 2400 BC, bringing metalworking expertise with them from the Continent but lacking skills in working with stone. In addition, certain approaches of Venus seem to have caused Earth’s body to move slightly, complicating the problem of determining possible alignments, as if the shifting and settling of stones over time had not made it sufficiently difficult. An apparently especially close approach of Venus ca 2200 (the 4.2 Ka event) caused the first inversion, accompanied by volcanic eruptions, earthquakes, and perhaps floods. Now the Sun, Moon, Venus, and stars moved from west to east. That meant that the Evening Star’s furthest elongation could be tracked in the northeast, and the Evening Star could be monitored in the southeast as well. This might explain the three post holes discovered in the southeastern side of the bank11 that are in respect to the center of the Aubrey Holes ring at a declination limit of -28º, close to the purported -27º declination limit of Venus for 2500-1500 BC.12 In fact, given the somewhat irregular and more elliptical orbit of ancient Venus than today’s orbit, it is possible that the Evening Star at greatest elongation was on a slightly more eccentric orbit, and thus a -28º declination limit might have been exactly right. We must also ask if changes were made at the northeastern entrance to facilitate monitoring of Venus. In response to the first inversion, the Beaker people appear to have felt a need to upgrade Stonehenge’s capacity for communicating with Venus. After all, the existing configuration had failed to prevent the catastrophic inversion, perhaps because the arc pattern formed by the Trilithon Horseshoe was not understood by Venus. So they built a bluestone oval13 inside of the Trilithon Horseshoe to make sure that Venus saw the oval and arc, and recognized their loyalty. The Sun, for its part, had played a mysterious role and followed an astounding trajectory during the inversion; and now it amazingly rose in the west. Therefore, to maintain balance with Venus and to honor the mighty, wondrous western-rising Sun, they set up a bluestone circle outside the Trilithon Horseshoe. The ensuing epoch saw the high tide of the metalworking Wessex Culture. Stonehenge appears to have been in constant use. Then “quite suddenly, or so it seems, something happened to disrupt the established order.”14 That something was the second inversion ca 1628 BC. After an unsuccessful effort around 1600 BC to build two more rings (the X and Y Holes), Stonehenge was abandoned, possibly in part because it had suffered damage from the inversion catastrophe. Over time Venus changed, too. It slowly lost its oval shape. Its giant tail diminished from encounters with Earth and Mars. After the third and fourth inversions, it became simply a beautiful “star”, considered by various peoples as an ever more subordinate companion to the Sun. Comprehending the role of Venus in archaeoastronomy and the Bronze Age catastrophes can help explain both the chronology of Stonehenge and the complex, changing patterns of its stones. Driven by fear and awe, and employing geometric patterns in masterful stonework, the ancient people who built and used megalithic Stonehenge were engaged in a dead serious effort to communicate with and show reverence for the gods in the sky above, in particular the terrifying Comet Venus. We can best understand this by applying to Stonehenge revised and enhanced versions of two theories of Immanuel Velikovsky. Interpreted in this way, Stonehenge in turn provides more evidence of these theories’ validity. Kenneth J. Dillon is an historian in Washington, D.C. who writes on science, medicine, and history. See the biosketch. For further detective work on ancient and modern history, see his The Knowable Past (Washington, D.C.: Scientia Press, 2018). 2. For instance, the notion that Venus approached close enough to lend hydrocarbons to Earth’s atmosphere, and these became the carbohydrates that formed the manna or ambrosia widely reported in conjunction with the catastrophes, seems entirely erroneous. 4. The first inversion was the 4.2 Ka event around 2200 BC. According to dendrochronology, the second seems to have been around 1628 BC; see Mike Baillie. Exodus to Arthur: Catastrophic Encounters with Comets. London: B.T. Batsford, 1999, p. 54. This seems consistent with a Chinese report of a ten-sun episode in 1615 BC; an inversion apparently typically took ten days. Sean Mewhinney, “On ‘the Year -687′”, Kronos, Vol. VI, No. 4 (1981), pp. 4-27. The last two were around 1210 and 820 BC; see David Kaniewski et al. Environmental Roots of the Late Bronze Age Crisis. PLoS ONE 8(8): e71004 (2013). 5. See other arguments for a lunar use of the site in Clive Ruggles, “Astronomy and Stonehenge”, Proceedings of the British Academy 92 (1997), pp. 203-229. 9. The alignment of stones at Ballochroy in Scotland, for instance, has been viewed as intended to track the summer solstice sunset but may have primarily been meant to track the setting of the Evening Star at its greatest elongation. 10. Mike Parker Pearson and the Stonehenge Riverside Project. Stonehenge. A New Understanding. New York: The Experiment, 2013, p. 91.